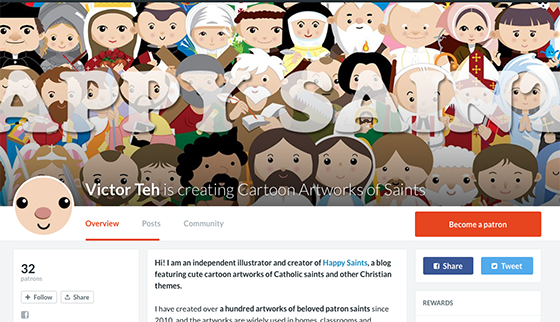 Over at the Happy Saints Patron Page, there are currently just over 30 wonderful patrons supporting the creation of more Happy Saints artworks! When I reach 100 patrons, I will give each patron a free “Happy Saints Inspirational Quotes" ebook. This ebook will feature 10 printable posters of inspiring quotes by saints accompanied by new Happy Saints artworks. It only takes $1 to become Happy Saint patron. The more patrons, the more REWARDS for every patron! So, I hope you will support the project by becoming a patron and we can do more for the New Evangelization!